What do you do for the tails? The same thing, only you have further to cut with the hacksaw blade? What about half-blinds? Brian, I work on the waste between tails just as I have in the past. 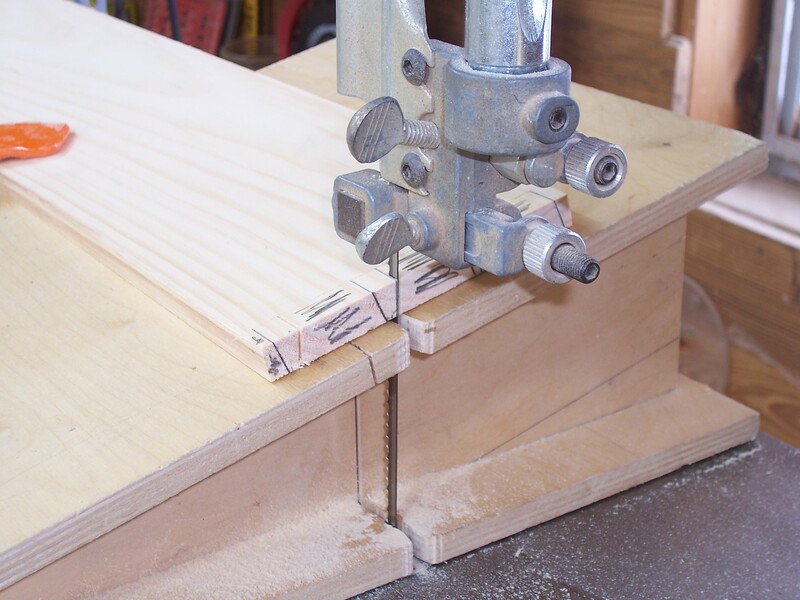 Once the pins are transferred to my tail board, I cut at the lines – I have begun to make these cuts with my dovetail saw instead of at my band saw – then chop my waste using chisels. 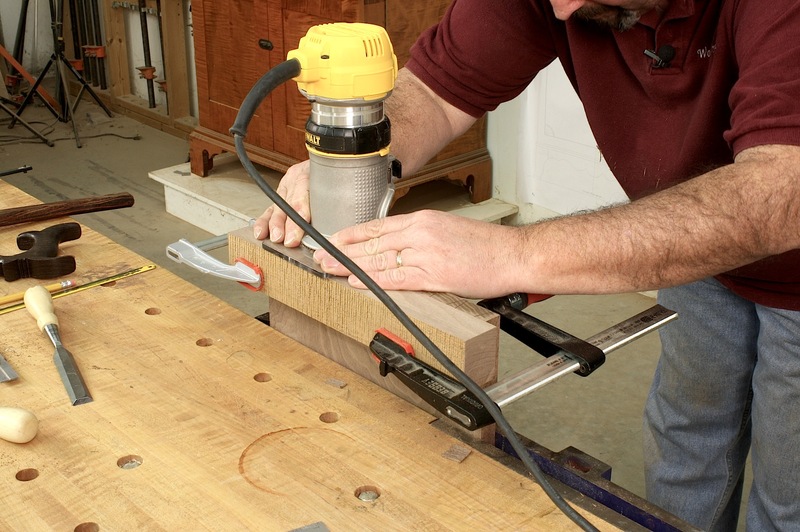 Or you can spend extra time at your band saw to trim the waste completely before testing your pins and tails fit. It looks like you could cut out the waste first and the use a chisel to create the sides, It would eliminate the sawing altogether! Tom G, In my opinion, guiding the router, although easy enough to accomplish as I demonstrate, would be more difficult if you had to hit the marks exactly. Also, paring with your chisel is too much work when compared to sawing to your lines. And sawing is way quicker. If you give your technique a try, please let us know how it works. The flat hack saw blade is a nice trick. Although I’m a hobbist, I appreciate you need for productivity in relation to profitability. I see no mechanical difference in your technique, either approach would effectively join the wood. 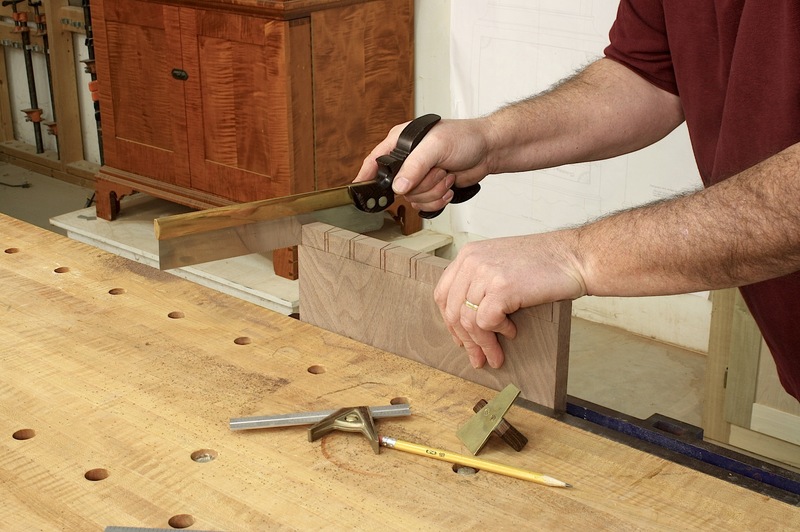 If you have a customer that is insistent on period-style hand-cut dovetails, why not demonstrate their identical nature with a pair of “knock-together” samples that you could stand on to demonstrate you point. Then share the time & material based up-charge that would be required for “true” hand-cut dovetailed joints. Hey, Glen- I figure that I may as well throw in my two cents, now that I have a whole year and a half of experience making dovetails. (Thanks to you and Mario Rodriquez at Connecticut Valley WS.) I have recently been practicing “condor tails” ala Jameel Abraham in his PW/August 2011 article. Since these are half-blinds, the tails are made first, using a band saw for the cuts. I know, having watched you in action, that you can cut a tail with a dovetail saw far better, faster and cleaner than can I with a band saw. I prefer using a fret saw for waste removal, but you seem to prefer banging away on your mallet and chisels. Okay, so I’m a wimp. Jameel has us doing waste removal on the pin board sockets with the router, except he has us using a top-bearing router bit. A 1/4″ deep recess is hand chiseled to the scribe lines to provide a wall for the bearing, then most of the waste is removed by the bit, with corner cleaning via chisels, right down to the bottom of the socket. I will vouch for its speed and cleanliness. You kept telling me in class that the craters I was making in the socket walls was because my chisels weren’t sharp enough, but it seems that you get them periodically, too. (Well, my chisels really weren’t sharp enough, but that’s another story.) I really like the way the sockets come out with this technique and appreciate your affinity for them. But I am in agreement with Ron Dennis. These are not truly hand-cut dovetails. I like his terminology of “hand-crafted”. I also appreciate your need for efficiency in productivity. I think Ron’s solution is most precise, but it is a fine line. Your method, and Jameel’s, is still jig work with a router. There is a time and place for everything. I think it is a matter of hair splitting semantics…”hand crafted”, “hand cut”, etc. Does it really matter? You are achieving the end goal of a nicely fitted dovetail joint. Technology has evolved. Why should you not take advantage of that evolution and use the most effective, efficient, method that you can? If it quacks like a duck, swims like a duck, and waddles like a duck; it’s probably a duck……. Keep it up and thanks for educating us! Buddy-I think that you are missing the point. You’re not bothered by the router technique, nor am I (see above) nor, I dare say, are most of Glen’s online support group. The problem has to do with his persnickety customers. Glen has to please them, appease them and give them what they want and/or expect. Therein lies the proverbial dilemma. Glen’s customers have seen his work, his books, his blog & some have even seen his DVD’s. In addition they’ve spoken with him. It’s safe to say they know what he’s doing/delivering to them. You wanted to get away from hand-cutting to be more productive, but you still have hand work and you are spending more time than necessary. There is a way to get a hand-cut look faster and without any hand work at all. Plus you can use your personal computer or tablet to layout a symmetrical pattern that eliminates any measuring or marking of either the pin or tail board. You can choose the size and spacing of your pins. All your pins will exactly fit your tail sockets and if you are cutting multiple boards any pin board will fit any tail board. We call them EZ PZ dovetails. All you need is a narrow neck HSS dovetail bit from Craftsman Gallery or WoodRat, a straight bit, a Router Boss with digital option, and a PC, laptop or tablet. Take a look at this web page: http://www.chipsfly.com/calculators/dovetail.html. We also have another online calculator for half-blind dovetails where you can use any dovetail bit on the planet to make all the cuts, use any size boards, cut the joint at whatever depth you want, space the pins however you like, no angles to set or cut, no templates or guide bushing, complete freedom. You can see a demo at WIA in Cincinnati.